Steamed Chinese dumplings often served at dim sum, filled with a mixture of shrimp and squid, these shumai are juicy, flavorful and delicious. 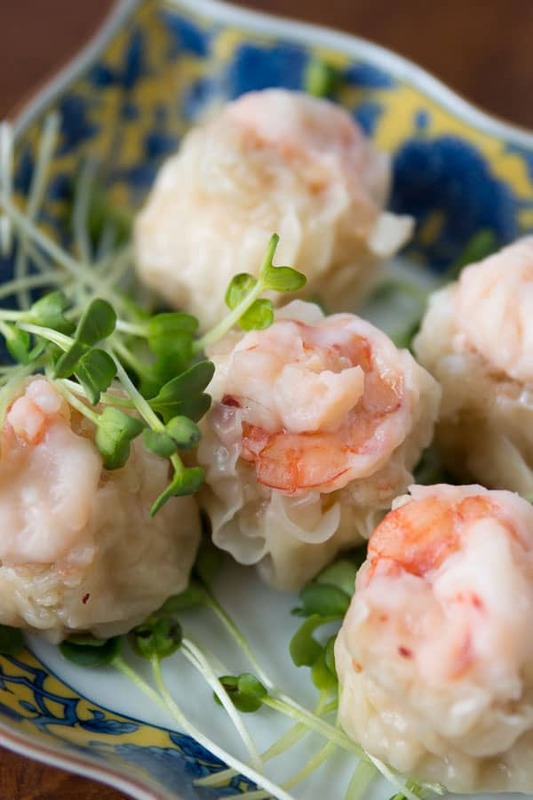 Shumai are a type of Chinese dumpling often associated with Cantonese cuisine. 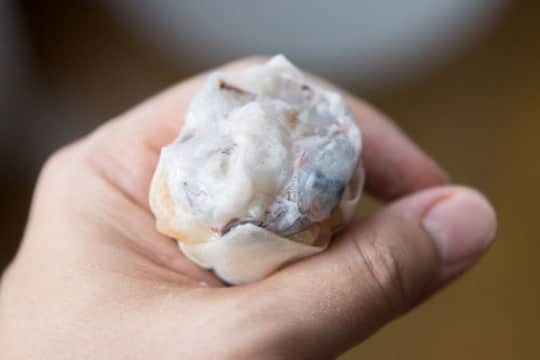 While many in the West have become familiar with it through dim sum (yum cha), it actually exists in many forms throughout China (and the rest of Asia). 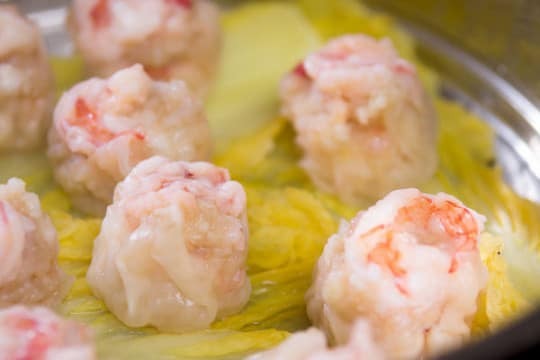 Steamed or pan fried, partially or fully enveloped in dough, filled with everything from pork to seafood to glutinous rice, it’s not clear what the original shumai was, but the most common forms involve a filling of pork partially wrapped in a thin round of dough before being steamed. When made properly, the plump, juicy half-wrapped dumplings, burst into a savory pool of flavor in your mouth as you bite into them. 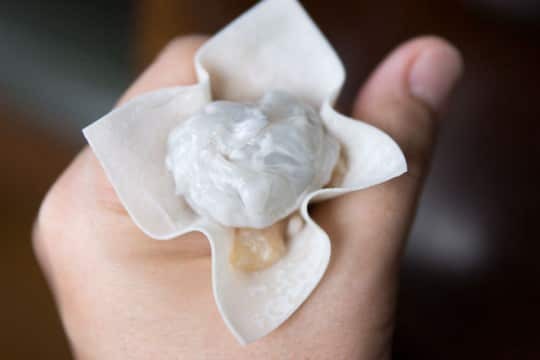 Unfortunately, many places puree the filling, giving them a hot-dog like texture, even worse, some places leave the shumai in a steamer until some unsuspecting soul orders a plate of the dry lumps of mystery meat. In my version, I’ve used a mixture of shrimp, squid and pork fat. The shrimp are added both minced and sliced to contribute two different textures. 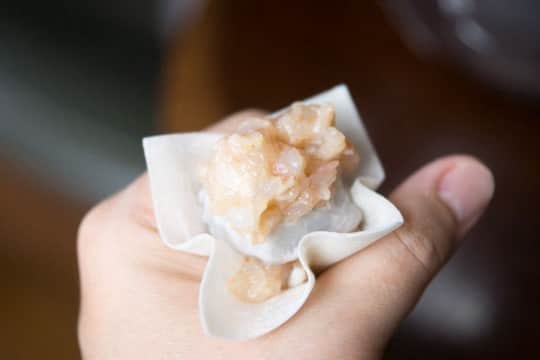 The minced squid lends a tender creamy mouthfeel to the filling, and because neither shrimp nor squid have much fat, the pork fat keeps the dumplings from drying out as they steam. Ideally you should prepare the filling a day in advance, so the flavors have a chance to meld, and the texture of the shrimp has a chance to firm up, but if you’re in a rush, these can be made in one go. 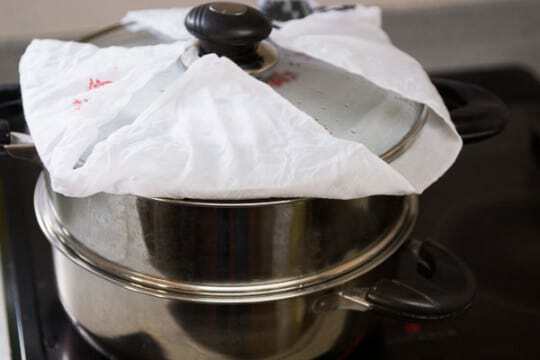 If you do make the filling in advance, make sure you wrap dumplings just before you steam them as the wrappers will absorb moisture from the filling and become mushy if you let them sit too long before. 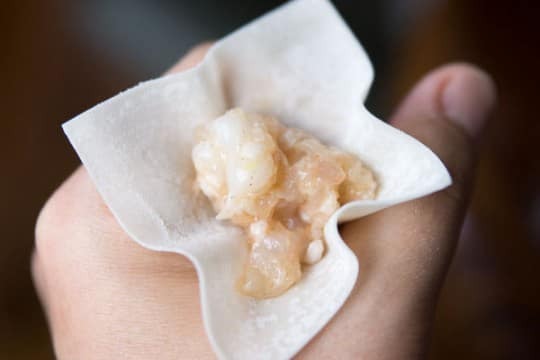 Because two-thirds of the shrimp gets minced into the filling, the size of shrimp is not important, since smaller shrimp are less expensive and often come peeled, it’s a question of cost and convenience. The other third of the shrimp are used sliced in half, so it’s best if you can get large black tiger prawns. As for the squid, smaller squid tend to get tough when cooked, whereas giant squid (the type usually used for calamari steaks), stays tender, so it makes for a better choice when making shumai. Peel the large shrimp, then use a sharp knife to slice them in half from head to tail (center). 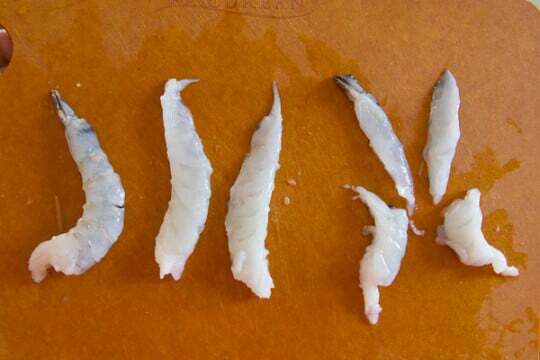 If your shrimp are very large, you may need to cut them in half once again (far right). Remove the dark vein if present, then add the shrimp to a large bowl. 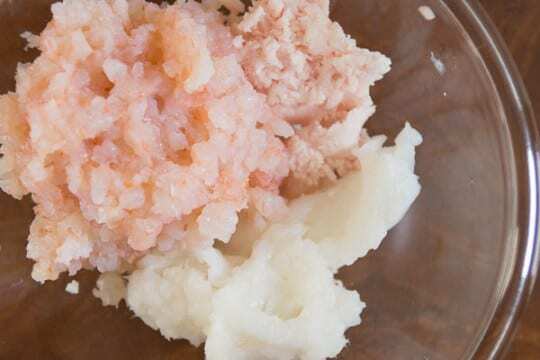 Add 2 tablespoons of egg white, 1 teaspoon of potato starch, and 1/2 teaspoon of salt to the halved shrimp, then use your fingers to vigorously "whisk" the shrimp together with the egg until the shrimp are evenly coated with a white froth. 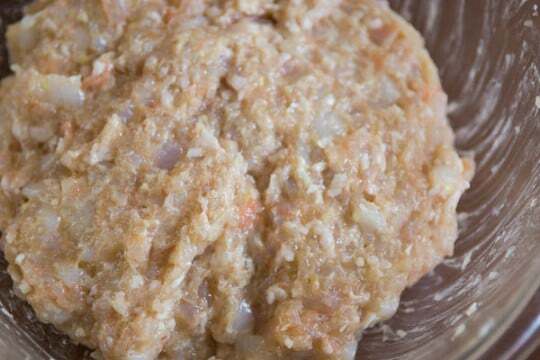 If you're using a food processor, roughly chop the pork fat, and add it to the food processor. Process until finely minced. Add the small peeled shrimp and calamari, and pulse until there are no big chunks, but not to the point where it turns into a paste. If you are doing it by hand, finely mince the fat, small shrimp and calamari separately and add to a large bowl. Add the scallions, potato starch, egg white, ginger juice, Shaoxing wine, sugar, sesame oil, oyster sauce, soy sauce, salt, and white pepper. Pulse the food processor until combined, or use your hand to "whisk" the mixture together thoroughly. Prepare a large steamer and line the bottom with napa cabbage or lettuce (this prevents the dumplings from sticking to the steamer). Bring the water to a boil. 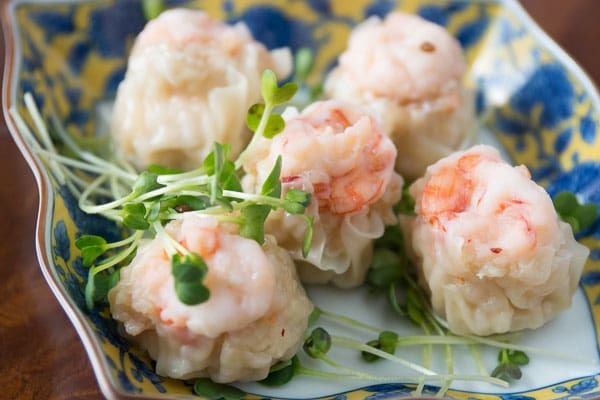 To wrap the shumai, form an "o" with your left hand (assuming you're right handed). Cover the "o" with a wrapper, then put a generous teaspoon of filling in the middle. Add a half shrimp on top, pressing the dumping into the "o". 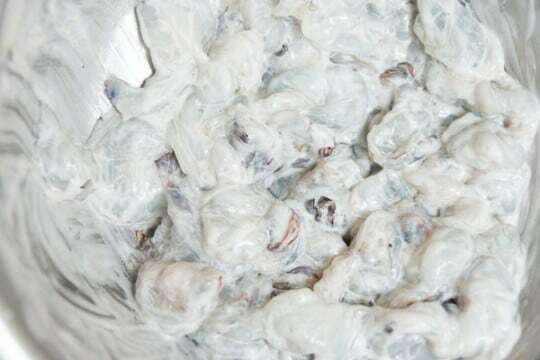 Add another teaspoon of filling, then use the thumb of your opposite hand to press the dumping all the way into the "o" shape in your hand, using your thumb to level off the top. Top with one more half of shrimp. Make sure the colored side of the shrimp faces up so it turns red when cooked. Make sure the top and bottom of the dumpling are flat, then repeat until you have enough dumplings to fill the steamer. Turn the heat back on and steam the shumai over high-heat for 8 minutes. Serve with vinegar and Chinese mustard. Tese are quote possibly my favorite dumplings! Great to have a recipe for them! These look delicious. My relatives want to go to Dim Sum this week while on holiday break and I was trying to explain to them shumai! I love yum cha – it’s our almost weekly meeting place for the family. Love the how-to pics, make everything looks so easy! Nice recipe! As you mentioned, there are many versions of shumai (or shaomai in mandarin) across China. The version from Shanghai, my hometown, uses ground pork, glutinous rice, and dried shiitake mushrooms. It’s definitely one of my favorites. Thanks for another great recipe! I could not find giant squid so I bought what I could find 5″-6″ body only not including the tentacles. Research tells me to soak in milk to tenderize -to compensate for not having giant squid(?) they soaked overnight and I will be making the squid/shrimp mix this morning and the shumai this evening. Your recipe didn’t specify if the tentacles are used or only the body. Would like your thoughts on tenderizing non-giant squid and the [non]use of the tentacles in this recipe. Thanks Marc! How about the tentacles? Do you normally use those in making the stuffing? I didn’t this time but If I can use them next time I will.